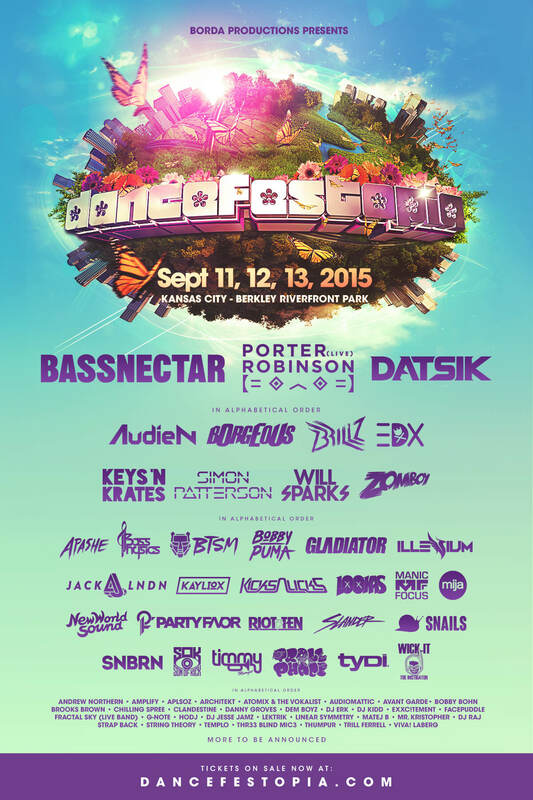 Dancefestopia’s 2015 lineup is a force to be reckoned with. With plenty of big names and a variety of genres for every electronic music fan, this fun-filled 3 day camping festival in Kansas City’s Riverfront Park promises to be one of the highlights of the summer festival season. Bringing main headliners Bassnectar, Datsik, and Porter Robinson (live), along with a plethora of other great acts, Dancefestopia is sure to be 3 days and 3 nights of raving paradise. Tickets for Dancefestopia are on sale now at their website. 3 Day GA tickets are currently at $159 and VIP tickets are $259 with camping passes coming in at $38 for GA and $124 for VIP. Dancefestopia is also offering 6 month payment plans with no interest, and early entry passes as well. Personally I absolutely love this lineup and the diversity of artists should be applauded. There really is something for everyone and I think Dancefestopia made a huge statement saying that they are here to stay with this lineup announcement. It is sure to sell out with such a great lineup so be sure to grab your tickets soon for this awesome camping festival in mid September!